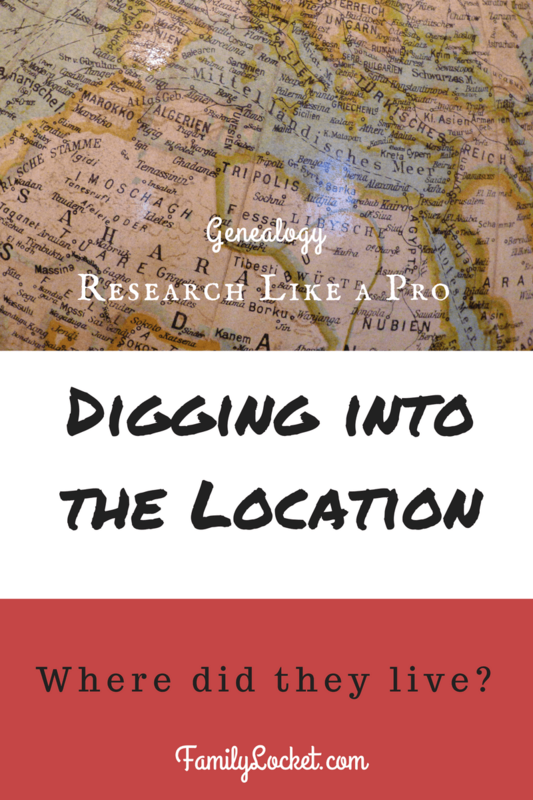 When faced with a tough research problem, have you considered digging into the location? Often clues or even the answer to your question can be found with an in-depth look at the places your ancestor lived, worked, and died. Professional genealogists thoroughly research any new area as part of their planning and so can you! In Part 1 of the Research Like a Pro series, you learned to form a research objective with key identifiers that would guide you in creating a focused research plan. Your task from Part 2 of the series was to revisit everything you or others have already found, create a timeline, then write questions and ideas for future research in your notebook or log. 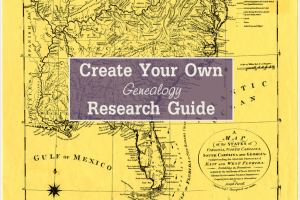 To read about all the steps in the Research Like a Pro process, I encourage you to read my book, Research Like a Pro: A Genealogist’s Guide. My summer research project is to find the father of my 3rd great grandmother, Cynthia Dillard. I started this research years ago and when I revisited my Dillard research, I realized that I had amassed quite a collection of records on George W. Dillard. Because my past research had led me to believe he might be the most likely candidate for Cynthia’s father, I revised my research objective. Determine if George W. Dillard, born 26 August 1781 in Virginia and died 21 May 1854 in Auburn, Lee County, Alabama was the father of Cynthia Dillard. Cynthia was born about 1816 in Georgia and died 2 August 1882 in Collin County, Texas. She married Thomas Beverly Royston about 1833 in Georgia or Alabama. Did George W. Dillard give his Chambers County land to Cynthia? Are there land records for that time and place? What is the history of the land in Chambers County? As you can see, my questions are going to require research into location. For this phase of research, learning about the location is very important. The first step is to choose one place that might hold the answer to your research question. Once you’ve settle on the location, several avenues of research can get you started. We’ll talk about each of these. –Search – Places: FamilySearch – Enter any place name in the world, then view that location on the map, get research links, alternate names for the location, and places with the same jurisdiction. Definitely a good place to start. –Atlas of the Historical Geography of the United States – historical, cultural, and geographic information from 1492-1931. –Cyndi’s List is a website of genealogical links. Use the search box to locate links to maps for your location. –David Rumsey Map Collection has thousands of maps for numerous time periods and locations world wide, all available to view from the website. 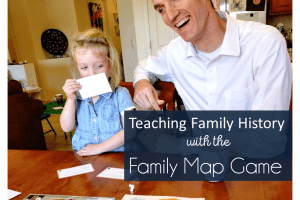 –Google Maps shows streets, schools, lakes, rivers, cemeteries, and more in a traditional map format. –Google Earth allows you to view any area topographically as it looks today. Discover the mountains, valleys, and rivers that influenced your ancestor’s movements. –Library of Congress Maps database has thousands of United states historical maps, many of which are online. Some are only available to view on-site. –Vision of Britain through Time contains topographic, boundary, historical maps and more for the British Isles. For my Chambers County, Alabama research, I started with the FamilySearch places webpage. Impossible to find on the main FamilySearch page, I discovered this resource on the Family History Library Facebook page. Entering “Chambers County, Alabama” into the search box, the map immediately zoned in on Chambers County. Notice all of the research links to the left of the page. What if you have a family history with a place name that doesn’t show up on modern maps? A gazetteer is what you’ll need to locate that historical location. Gazetteers describe everything from towns and villages to rivers and mountains. The FamilySearch Wiki lists gazetteers for countries and U.S. states. Enter “gazetteer” and location into the search box or look for the heading “Gazetteers” on the right hand side of the locality’s wiki page under “Background.” Many of these have been digitized and are available to view from your home. 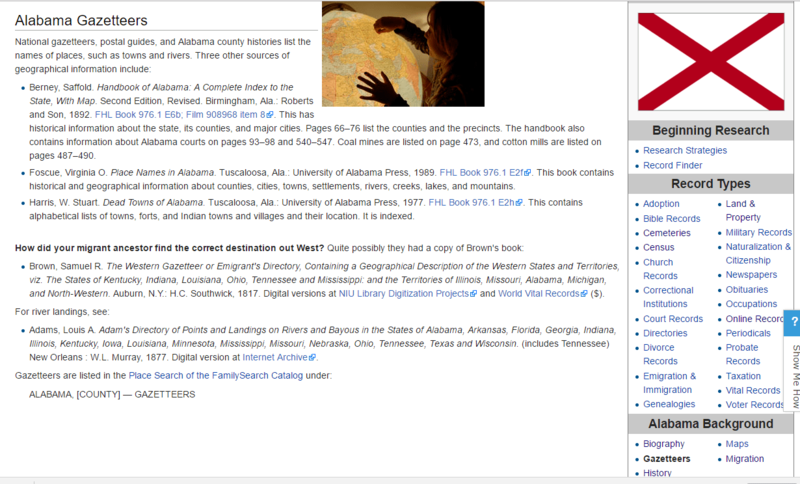 The FamilySearch Wiki screenshot below lists three possibilities for Alabama Gazetteers. Notice the heading “Alabama Background” in the bottom right corner with links to pages about Alabama maps, history, biography, migration, as well as gazetteers. 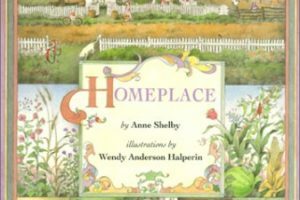 Each of these pages might have information helping you to understand location. 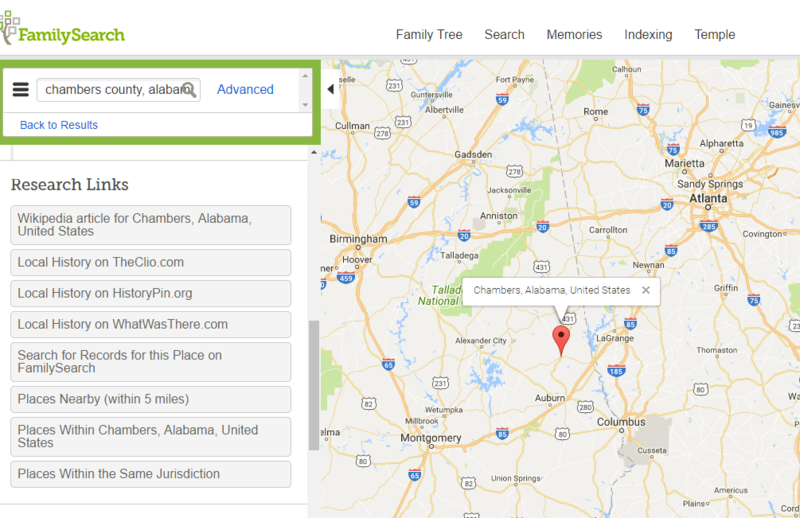 The first entry listed in the FamilySearch Wiki, Handbook of Alabama, A Complete Index to the State, with Map, is digitized and available to view from the comfort of home. Published in 1892, it gives information about each county in Alabama as well as a listing of newspapers, banks, courts, land districts, judicial circuits. A short history gives insight into the time period I’m researching George W. Dillard’s land purchases. With people pouring into Alabama after statehood, it makes sense that George purchased land and moved to Alabama. A key part of research is figuring out the jurisdictions of the government, church, or community bodies that recorded the events of your ancestors. When states were created, county boundaries were large. As the population grew, the counties divided and boundaries changed. An individual’s records might be in the parent county and as well as the county newly created. How do you even start learning about boundary changes in your location? 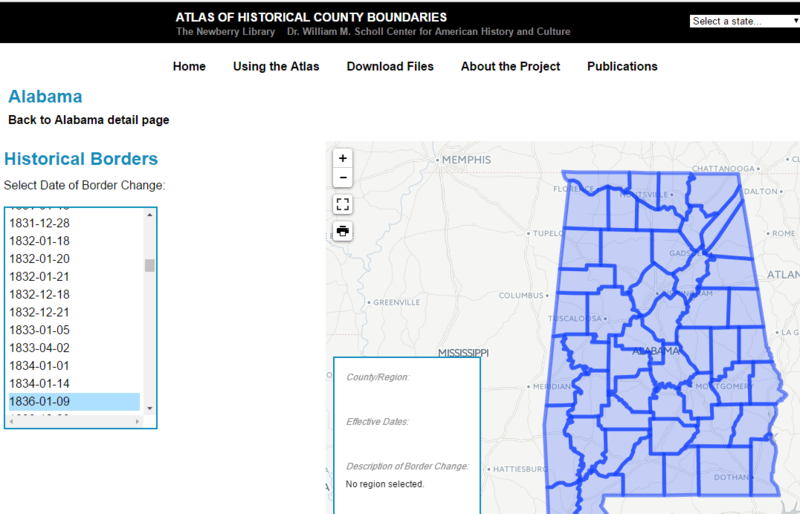 The Atlas of Historical County Boundaries, by the Newberry Library is an interactive website showing United States county border changes. The screenshot below shows the county boundaries of Alabama in 1836, the date I selected. Hovering my mouse over Chambers County, a text box appears detailing the date the county was formed, 1832 and when the boundary changed, 1866. It also gives the parent counties of Montgomery and Shelby. If I am searching for records pre 1832, I’ll need to look in those counties. It might seem obvious to research the history the place where your ancestor lived, but often this is a vital step missed in the hunt for records. County histories, biographical sketches, periodicals, church histories and newspapers can help you learn about early settlers and give you valuable clues about where to search for records: churches, schools, businesses, etc. Where do you start your search for these records? My post “The FamilySearch Catalog: A Researcher’s Best Friend” gives tips on using the keyword search option. Enter your location and discover the sources that might be available. Newspapers give wonderful details of the community but researching them can seem overwhelming with so many websites to search. Here are three free sites that I use to find online newspapers. –Chronicling America – Historic American Newspapers on the Library of Congress website has newspapers from 1789-1924. You can even search this site on the go if you download the app “OldNews USA” to your smartphone. –The Ancestor Hunt website keeps an up-to-date list of links by state of online historical newspapers; valuable because newspapers are often digitized by universities or societies. –Elephind.com has over 3 million digitized newspapers from libraries and universities across the country. The database is continually growing so check back often to see if your location has been digitized yet. Your task? Choose one location from your research objective and learn all that you can about the geography, migration into the area, jurisdictions, boundary changes, and the local history. Best of luck in your research. Ready for the next step? Go to Part 4 of Research Like a Pro: What’s the Plan? ¹ Saffold Berney, Handbook of Alabama: A Complete Index to the State, With Map. Second Edition, Revised. (Birmingham, Ala.: Roberts and Son, 1892), 531. Do you want to take your research to the next level and practice assignments with a group of 5 others? You’ll do peer reviews and get feedback from a professional genealogist in our Research Like a Pro Study Group with Diana Elder AG®. What a great article! Just jam-packed with information. I was not aware of the Atlas of Historical Geography of the United States – I will have to add that to my list! Thanks! Thanks, David. From a location specialist, that is high praise indeed. I’m glad I could share something new with you!